Blog Does the Long Renewal Period Compromise Signature Verification on Ballots? Does the Long Renewal Period Compromise Signature Verification on Ballots? “When it’s deemed questionable we will reach out to the voter be email, by mail and by phone,” Valenzuela said. Which is why it’s so important that the county has current contact information so an election worker can verify when and how a voter submitted a ballot. If an election worker does verify a ballot in this way, they’ll ask the voter permission to update their signature off the most recently submitted ballot so the entire process doesn’t repeat itself during the next election. 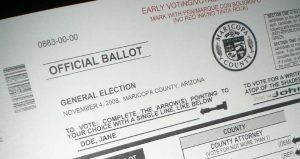 Voters in Maricopa County can check their early ballot status online. “If you are one of the 1.6 million Arizonans who have been voting early and you have not heard from us then likely we have a signature that is updated,” he said.